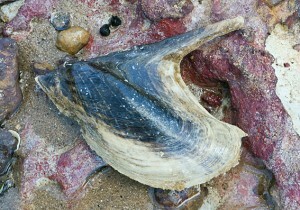 The Penguin Wing Oyster is the largest member of its genus, growing to over 200mm and characterised by a black shell exterior and a very long extension of the hinge. The Wing Oysters (genus Pteria) are closely allied to the commercial Pearl Oysters (genus Pinctada) and show the same deeply nacreous (‘mother of pearl’) shell interior. The Penguin Wing Oyster is in fact used for the production of mabé pearls (also known as ‘half-pearls’ or ‘blister pearls’) for the jewellery industry. In this process, hemispherical pieces of plastic or shell are glued to the inner shell of the living wing oyster. Subsequently the mantle tissue of the wing oyster coats the hemispherical piece with nacre and the resulting pearl halves are then cut from the shell. The Penguin Wing Oyster lives in shallow water to depths of up to 20m, attached by hair-like byssal threads to a wide variety of things including corals, sea fans (gorgonians), sea whips, rocks, logs and sometimes even shipwrecks.